Football: Where would it be without the Olmec? 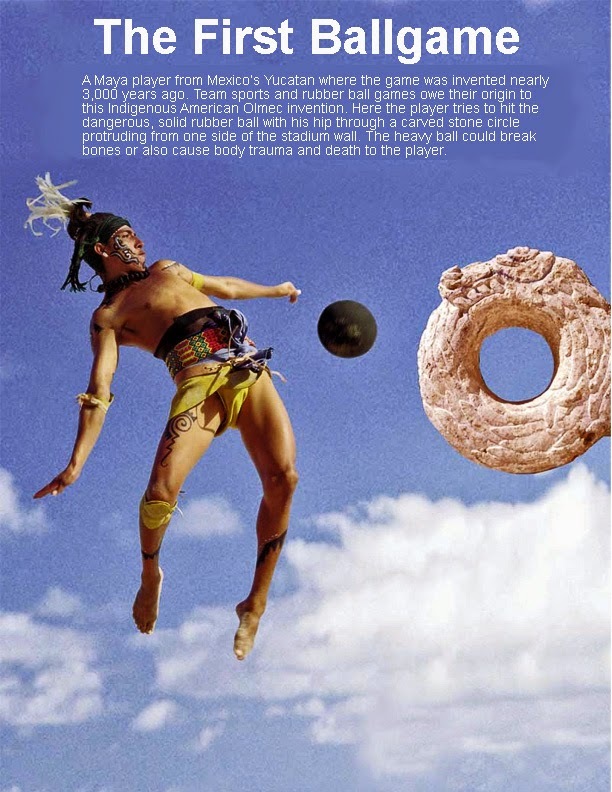 Above: (L) A Caribbean Taino ball player on a soccer ball. the Portuguese ambassador tho the Spanish Court. Above: (a) Ruins of a Maya ball court in Yucatan, Mexico. (b) Carving of a Maya ball player. (c) A carved stone hoop removed from a stadium wall. The FIFA World Cup tournament in Brazil is continuing the traditional international fervor for ball games. The World Cup started in 1930, Brazil has won the most times, fittingly with five wins under her belt. Next to the Olympics, this is the most watched and celebrated sport event in the world. The rubber ball game began in the Americas, so, why has it been so hard to chronicle ALL of football, or "soccer's" contributory beginnings? Especially when the people who invented rubber from a tree sap named themselves after their world-changing invention. The product took over a thousand years to hit the world market. When I was a lad growing up in the Caribbean we played football, the game that actually describes how it is played. When I arrived at Howard University in 1962 the game that Americans called soccer was dominated by the foreign students from the Caribbean and Africa. The ball that I played with was made from sewn strips of leather, a lace to close the innards, and a tube or bladder made from an ancient Amerindian invention, rubber. It was this borrowed indigenous sap or blood of a Tropical American tree, Hevea brasiliensis, that made soccer/football possible. Without this vulcanized invention we would be left with how the game originated, kicking a stuffed leather or grass ball. With that dead trajectory, we might as well be playing rugby. It is doubtful that football would have gotten off the ground to become a World Cup event. I am still trying to find mention of the Olmec genius who figured out how to bleed a tree and, through the process of vulcanization, produced a bouncing ball, waterproof capes and shoes, an exfoliant, bungee straps, and toys. It was not until the 19th century that this Amerindian invention was exploited (as most other indigenous goods were) taken out of the Americas only to return to the Amazon jungles with world-wide fixated attention. Even the Latin name for the tree is “Brazil”. The only more appropriate homecoming for the ballgame, would have been Mexico. Maybe latex is in the blood of Brazilians, Mexicans and others who have dominated the rubber ball game for centuries while other people were kicking around tufts of grass or the skin of an animal. Do I expect Mexico's Olmec, who invented the rubber ball and one of the world's earliest team sports, or the Caribbean's Taino civilization, who introduced the magical sphere to World Cup football to get credit at all? What about the offshoots, basketball, volleyball, tennis or any game played with a bouncy ball? Not really. After all, it is only rubber on the tip of a pencil or as a condom, right? I often muse at the arrogance of the invaders in citing Amerindian accomplishments. "They did not develop the wheel", is the common refrain. Yeah. Only for toys. On the other hand, the wooden and steel wheels were dragging along in an Eastern Hemisphere wasteland for centuries, until Olmec rubber revolutionized the wheel, often mentioned as a benchmark of "civilization". With Amerindian rubber, the cart or carriage became an automobile, truck and aircraft only by the grace of the Olmec. Try driving one of those around on steel rims! The ungrateful benefactor generations that inherited the Olmec legacy have never been taught this Amerindian lesson. What do they know of the other treasures, precious metals, stones, pearls horticultural products and Amerindian technologies that enriched their "First World" homelands? It is summer, so, just whip out the Amerindian hammock and throw a shrimp on the Taino barbie! Don't forget the Mexican invented corn. Early soccer/football was like a three legged dog. It could function, but could it run at Greyhound speed without a fourth appendage? So too is the fast-moving composite game called soccer. In the book by David Goldblat titled "The Ball is Round: A Global History of Soccer" the author chronicles the history of the game that the world calls football. He stated that cultures like the Australian Aborigines, Chinese, Native Americans [the Powhatan Confederacy of Virginia], Egyptians, Japanese and other SE Asians, all played a type of football. The Chinese want to take credit for its invention... But hold on! Their balls were made from straw, others from rattan or stuffed leather. During the "founding of America", Virginia Governor William Strachey, described how Powhatan Indians played a fast ballgame with their feet or with a bat. 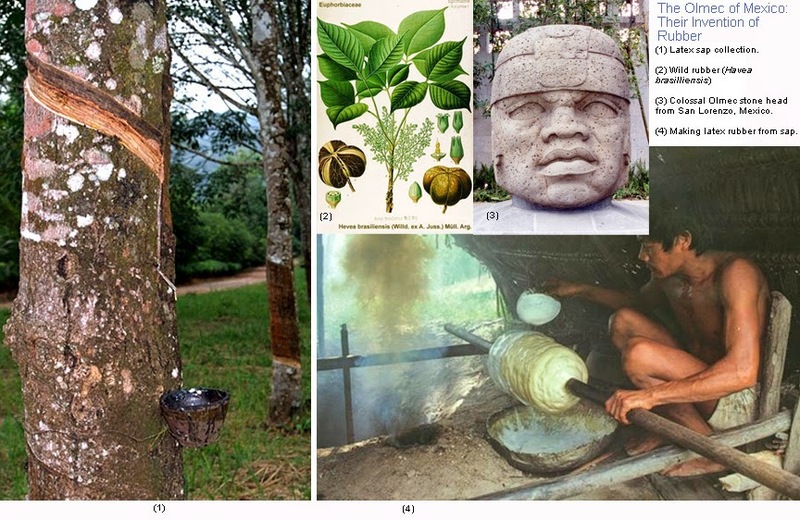 He failed to be mention that the Amerindian, specifically the Olmec of Mexico discovered how to use latex from the sap of the Hevea brasiliensis tree. Their use of rubber completely revolutionized the ball and how the contemporary game of football/soccer is played. The Maya, who built impressively large ball stadia from stone, were successors to the Olmec, whose name translated loosely to "People of the Rubber". This lack of credit to Amerindians by some writers is typical. The World Cup football contests are being played out in the homeland of latex rubber, and yet it is made to seem like an import to the Brazilian Amazon from of all places, 19th century Europe. When the Spanish arrived in the Caribbean with Columbus in 1492, the rubber ball game was already more than one millennium old. The Spanish marveled at the bounce of the Taíno batu, calling the elasticity of the bounce witchcraft. 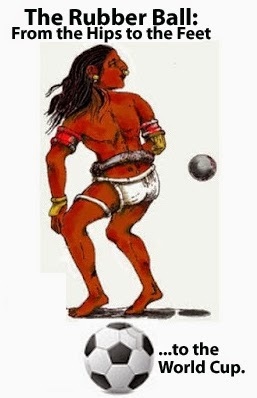 Male Taino ball players used their hips to keep the ball airborne. No sissy stuff with the hands or feet. Women either did the same or kicked it or swatted it with a bat. They played on a clay court using two teams. When the ball hit the ground, it was considered dead and a point would be awarded. One can still visit these ball courts or batey in Puerto Rico. The rubber ball game was found as far north as Arizona. During rough times, the Mexica (Aztec)imported increasing number of rubber balls from the Yucatan provinces to placate the people. In Central America where the ballgame was invented, the emperors built walled stadia with two carved stone circles, protruding from the East and West walls, with a hole in the center, just large enough for the sold, bone-breaking latex ball to pass through. Sounds like basketball, doesn't it? There, both teams were warriors intent on playing a spiritual game, the outcome of which involved the gods and fate. Gambling kingdoms away were sometimes at stake and the building of stadia increased when strife threatened the Mexica (Aztec) Empire. In some versions of the game, warrior-players were prepared to die, some as honored sacrificial messengers to the gods; others as losers. The movement of the ball in the air could represent the all important movement of the sun, whose fate was in the hips of the ball player. Teams could represent light or dark. 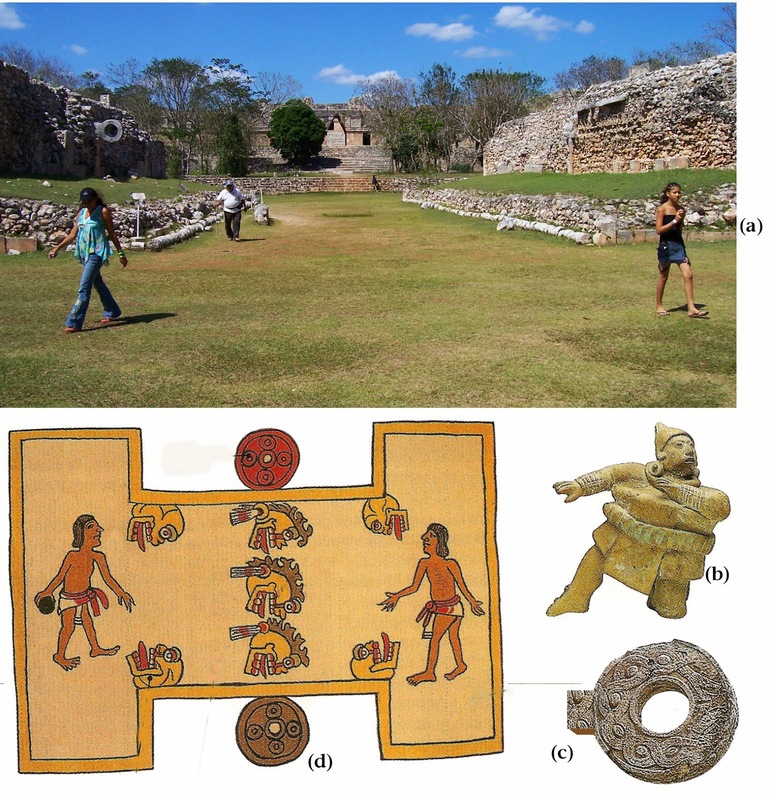 With the fall of Mesoamerican empires and Spanish intervention both in the Caribbean and Mainland Central America, the rubber ball game almost disappeared. Although it is still played in villages in Mexico, it was replaced by football. Not much is different between the ancient spectator ballgame and other rubber ball games that took its place. While batey was played as a social game in the Caribbean (you know us; we like sun and fun), gambling was prevalent among the Amerindians of both the Caribbean and Mesoamerica. Like the Catholic practice of a bloodied, sacrificed Son of God that replaced blood sacrifice in Central America (not to mention the introduced Christian practice of ritually drinking the blood of Christ and eating his body), football replaced the need for dispatching warrior players as messengers to the gods. However, the brutality that follows some European fans (especially in stiff upper lipped England) still seems to call for spilled blood. Not from the players, but from their beer crazed fans.